MailChimp is an online application for managing email marketing lists and sending out HTML email campaigns. Offering a simple and intuitive interface, easy mailing list management and a drag-and-drop campaign editor… there really is no better tool for maintaining and broadcasting your email newsletters. you send less than six email campaigns per month. For most individuals and small businesses, this is more than enough. As your list grows, however, MailChimp offers a tiered pricing structure. If you intend to send out emails regularly (i.e. at least once a month), then you are better to go with their monthly subscription. If sending mailouts more than once a month is unlikely, then the “pay as you go” option is probably best – this involves purchasing blocks of credits before your mailout is sent. MailChimp comes into its own when used with a fully-editable and re-useable template, with a customised design for your company’s branding. Once the HTML email template has been designed and built, special tags are inserted into the regions you want to make editable. It’s also possible to set certain elements to be repeated (like a block for a news article) or toggled on and off completely, if you didn’t want an element to appear for a particular campaign. Once a template is loaded into MailChimp, it remains in your list of templates for use again in the future. Simply create your new campaign, select your branded template from the list and use the drag-and-drop editor to add your new content. Making text changes, inserting new images and moving blocks of content around – all are easily achieved with MailChimp. If you need a MailChimp template creating, please get in touch to discuss your requirements. Of course, you don’t necessarily need MailChimp in order to send your HTML email campaign. There are other similar tools available or maybe you just need a static HTML email creating for use with your own email broadcasting software. HTML email templates are something that I have lots of experience with, including design, development, testing, content strategy and broadcast. If you need help setting up a branded email template, please contact me to find out how I can help. Along with websites and social network profiles, a good email newsletter is another way to keep in touch with your customers. Most of the websites I build use WordPress as their CMS, which offers a range of plugins to integrate your website with your MailChimp mailing lists. Maybe you want to offer a newsletter subscription option directly on your website? Or maybe you want to automatically subscribe people who complete your website’s contact form? All of these are simple to achieve and add value to your website, both for your business and its customers. MailChimp integration with WordPress is just one of the many services I offer. Just to make things even easier, the clever chaps at MailChimp provide Android and iOS apps which allow tap-friendly access to your campaigns. You can manage subscriber lists, create new campaigns and view reports on native mobile apps. 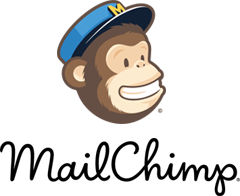 MailChimp offer two apps: MailChimp Mobile allows easy management of all your reports and mailing lists, whereas MailChimp Editor provides a drag-and-drop interface for working on draft email campaigns from wherever you are. The design and build of email templates is something I offer as a service to my customers. Whether that be a one-off HTML email template or a fully editable and re-useable MailChimp template… I’m here to help. If you require a HTML email template, need a bespoke MailChimp template creating, or need help getting going with your next email campaign… please feel free to get in touch.